President Bush warned the United Nations Thursday that it must force Saddam Hussein to destroy his weapons of mass destruction or "action will be unavoidable." 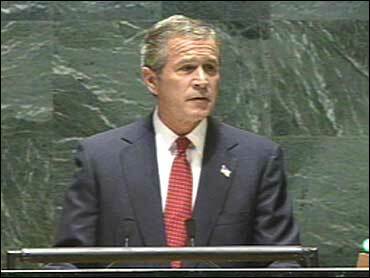 "We cannot stand by and do nothing while dangers gather," Mr. Bush told the U.N. General Assembly. "We must stand up for our security and for the permanent rights and hopes of mankind." Mr. Bush made his case against the backdrop of widespread hesitation among U.S. allies and American lawmakers to use force against Baghdad. U.N. Secretary General Kofi Annan cautioned the United States against taking action on its own without Security Council backing. Mr. Bush's speech amounted to a challenge to the United Nations to live up to its responsibility. "Iraq has answered a decade of U.N. demands with a decade of defiance," Mr. Bush said. "All the world now faces a test ... and the United Nations, a difficult and defining moment. Are Security Council resolutions to be honored and enforced ... or cast aside without consequence? Will the United Nations serve the purpose of its founding ... or will it be irrelevant?" Mr. Bush offered to work in concert with other nations on a resolution "to meet our common challenge." And, he said, "if the Iraqi regime defies us again the world must move deliberately and decisively" against the Iraqi leader. Mr. Bush's expression of willingness to act through the U.N. appeared to respond to a growing chorus of opposition to unilateral U.S. military action to topple Saddam. A senior U.S. official said Secretary of State Colin Powell would work on Friday with the four other permanent members of the Security Council – Russia, China, France and Britain – on a resolution that would set a deadline for Iraq to comply with demands that it admit weapons inspectors. Annan, speaking minutes before Mr. Bush, called on Iraq to allow weapons inspections "for the sake of its own people." But he also insisted that only the U.N. could authorize the use of force in cases that went beyond straightforward self-defense. In a strong appeal for respect for international law and multilateral action, Annan said: "Even the most powerful countries know that they need to work with others in multilateral institutions to achieve their aims." The Bush administration has made clear it feels justified in going it alone if necessary and contends it does not need new legal authority to use force to try to oust Saddam. In his speech, Mr. Bush said a failure to act on Iraq, would mean betting the lives of millions in a reckless gamble. "And this is a risk we must not take," he declared. "By heritage and by choice, the United States of America will make that stand," the president said. "Delegates to the United Nations, you have the power to make that stand, as well." Mr. Bush backed his appeal with a 22-page document accusing Saddam of a decade of deception and defiance of 16 U.N. resolutions. "The conduct of the Iraqi regime is a threat to the authority of the United Nations and a threat to peace," he said. On a personal note, Mr. Bush said that Iraq's violence and terrorism led to the attempted assassination of his father, former President George H.W. Bush and the emir of Kuwait in 1993. "Saddam Hussein has made the case against himself," he said. Mr. Bush wants the 190 U.N. nations to pressure Saddam to readmit international inspectors after a lapse of more than 3½ years to look for hidden arms and then to compel him to disarm. These demands are rooted in resolutions adopted during and after the 1990-91 Persian Gulf war that forced Iraq to reverse its annexation of Kuwait. Iraq denies it is developing weapons of mass destruction. For its part, Iraq bluntly warned Washington it was ready to repel any invasion with every weapon at its disposal, even kitchen knives, sticks and stones. Speaking hours before Mr. Bush's speech, Iraqi Foreign Minister Naji Sabri denied his country had weapons of mass destruction and said Baghdad still hoped to avoid any attack. "But if we are attacked, we will choose our own means by using every thing at our disposal, even sticks, kitchen knives, our hands and stones," he said. Meanwhile, defense officials in Washington said the U.S. military's Central Command would move up to 600 members of its headquarters staff from Florida to the Gulf Arab state of Qatar, near Iraq, for a three-week exercise in November. U.S. officials declined comment on speculation the newly expanded base would play a key command role in any invasion of Iraq, but one senior official said they were considering making the shift permanent. U.N.-Iraq talks since March have failed to get Saddam to agree to the return of inspectors, who left in December 1998 ahead of U.S. and British air strikes to punish Saddam's government for not cooperating with inspections. Iraq said it wants to continue the dialogue — but with a broad agenda on outstanding issues which Annan has rejected. Nearly every country in the world, with the exception of Britain and Israel, has expressed grave misgivings about a pre-emptive attack on Iraq, and many want prior approval by the 15-nation U.N. Security Council of any military action. Mr. Bush's efforts to win congressional support were having mixed results, as well. The chairman of the Senate Foreign Relations Committee said Wednesday that he did not think the time had run out for diplomacy. Moving alone against Iraq would be the worst option, said Sen. Joseph Biden, D-Del. "I will be extremely disappointed if the president goes and enunciates a unilateral approach: 'The world be damned, here we go.' That is not in our interest," Biden said told the World Affairs Council of Philadelphia.